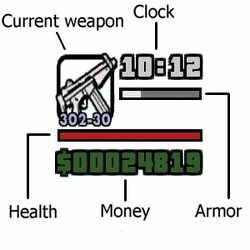 Illustrated example of a HUD as seen in GTA San Andreas. A heads-up display, often abbreviated as HUD, is a set of indicators used in most games to show the player's current status in a game, such as the score, health and the like. A HUD can be used to convey many different types of information, such as time, score, money, health, armor, weaponry, ammunition, warnings (eg "wrong way" in a race), maps with blips, and subtitles of conversations. Weapon selected and amount of ammunition. Mission title (GTA III onwards) when starting a mission. Oxygen remaining (GTA San Andreas) or stamina (GTA Vice City Stories) when in water. Player character stats and skills (GTA San Andreas). Wanted Level. Starting with GTA San Andreas (except GTA Advance), the wanted level interface does not appear until the player has a wanted level. Time (GTA III and later, with the exception of Grand Theft Auto Advance), indicated by a 24-hour clock. Vehicle speed (GTA Advance), in kilometers per hour. The vehicle the player enters. The district the player enters. The street the player enters (Grand Theft Auto IV). Location Compasses, compass points to key locations (GTA 1 to GTA 2). A radar, a small map of the player's current location (GTA III onwards). Altitude meters are also integrated into the radar for GTA San Andreas and The Ballad of Gay Tony. Other elements appear on the HUD in other situations, such as a dialogue subtitles, help messages, and a "Busted" or "Wasted" sign if the player gets arrested or killed respectively. GTA London 1969 and London 1961. GTA III (PC/Xbox version) (PS2 version, iOS/Android version). GTA Vice City (PC version) (iOS/Android version). GTA San Andreas (PC version) (iOS/Android/Remastered version). The bottom money counter shows the player is in debt as a result of gambling. GTA Liberty City Stories (PS2 version) (PSP version). GTA Vice City Stories (PS2 version). GTA IV (upper right HUD) (Radar, with additional HUD elements). The Ballad of Gay Tony. In the theme of the colorful nightclub image, the HUD is now both white and purple (Radar). In the Nintendo DS version of GTA Chinatown Wars, the information that would have been on the HUD in earlier games (except for the Wanted Level and place/car names) are moved to the bottom screen as part of the PDA. This page was last modified on 25 June 2015, at 00:03.